How do I use Beamman’s Breath Effect? Why don’t I see anything when I load Beamman’s Breath Effect? … and a FIRE BREATH anytime! A reader asked me, today, about Beamman’s Breath effect. I had to fiddle with it, a little, before I discovered the trick. Either version worked well for me… but the 1.1 version includes FIRE BREATH… so that’s the one to get! Yup… you have to customize the effect for your particular model. The FX file needs to know which model you are using. The edit is simple. 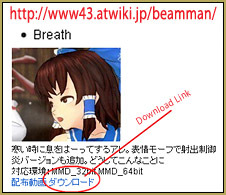 First, go into your Model folder, inside your UserFolder in MMD, and copy the file name of the model you want to use. This edit needs the exact file name of your model. Then, navigate to your BREATH effect folder and “Open With” the Breath.fx file using Notepad or Notepad++… and in the third line, or so, of text you will see where to replace the old model name with your new model’s name. Then, Save and close the file. 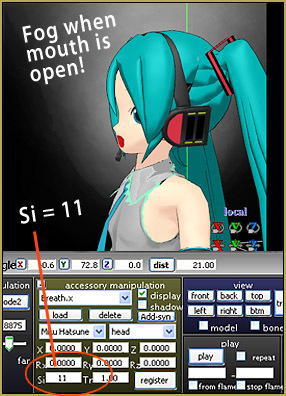 You probably won’t see anything… you need to adjust the effect so it is attached to your model’s head bone. And, for this test, set the Si to 11… ! NOW… you probably STILL won’t see anything! 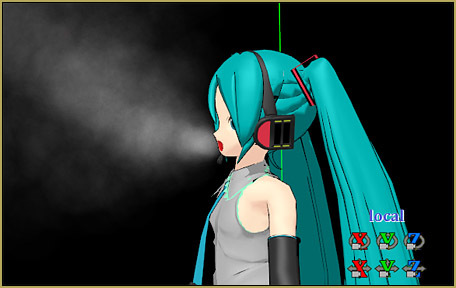 Go back to your Model and open her mouth Aaaaah… and see all the fog! 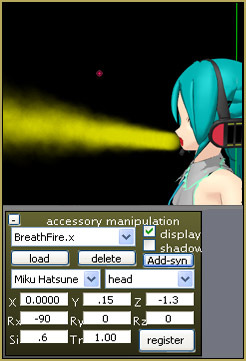 The Breath effect is coupled to the model’s mouth! As you open and close the mouth, the “breath” increases and diminishes, accordingly! The effect seems to “not work” until you start flapping your model’s jaws. 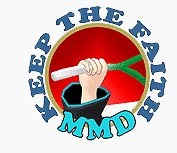 The key to the use of this effect is in the Accessory Manipulation adjustments. To get the fog to go “forwards”, set the Rx to -90… to raise the fog to the model’s mouth area, increase the Y setting a little: like .2 … and to move the fog away from the center of the head, set the Z to about -1.2 or so. I also adjusted the Si to only .8 for this picture… more than that made it look like she was on fire! Inside your Breath Effect v1.1 folder is FireBreath.x … a fire breath effect! 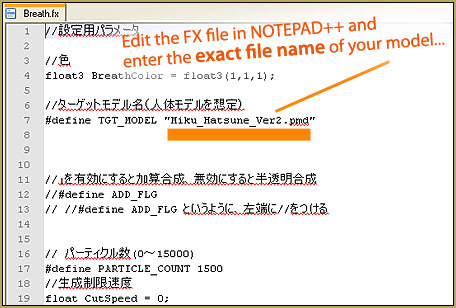 It works the same as Breath… you need to edit the .fx file with the exact file name of your model. The Si size and the other settings are important to making this effect look right. One of the odd things about this effect is that it really only works from a side view of your model! As you swing the camera around, you will see how the effect isn’t really coming out of the model’s mouth. From different points of view, it’s all over the place. I haven’t tried this, myself, but I imagine you can rename the effect’s files so you can have multiple instances of it onscreen at the same time… one for Miku, one for Rin, one for Kaito, and so forth. 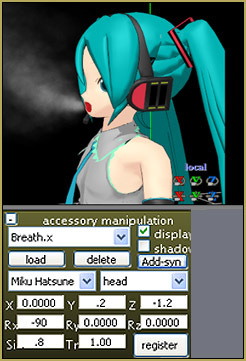 You would name both the .x and .fx files with the same custom name… MikuBreath.x and MikuBreath.fx … something like that should work. This scheme would also let you keep the customized files onhand for your various models. Have fun with Beamman’s Breath effect! Wait, what if you want it on more than one model? ?